(NaturalNews) Truvia sweetener is made from about 99.5% erythritol (a sugar alcohol), and 0.5% rebiana, an extract from the stevia plant (but not at all the same thing as stevia). 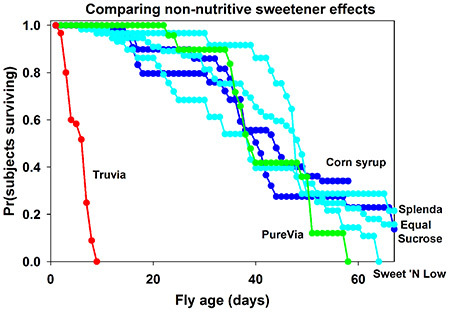 A shocking new study published in the journal PLOS ONE (1) has found that Truvia, an alternative sweetener manufactured by food giant Cargill, is a potent insecticide that kills fruit flies which consume it. The study is titled, Erythritol, a Non-Nutritive Sugar Alcohol Sweetener and the Main Component of Truvia, Is a Palatable Ingested Insecticide. 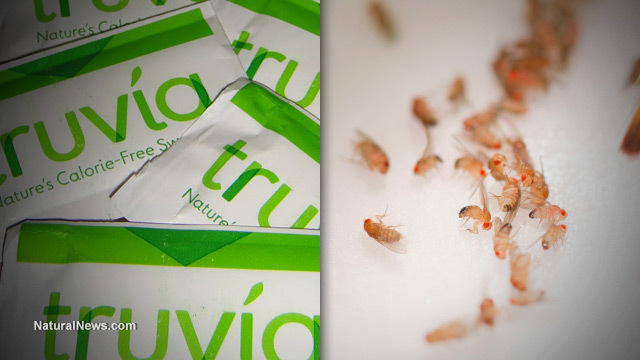 The study found that while fruit flies normally live between 39 and 51 days, those that ate the Truvia ingredient erythritol died in less than a week. Erythritol is often indirectly derived from genetically modified corn, by the way. Cargill was forced to settle a class action lawsuit last year (2) for labeling Truvia "natural" when it's actually made from a fermentation process whereby yeast are fed GM corn maltodextrin. Cargill plays word games with this process, insisting that "erythritol is not derived from corn or dextrose feedstock; it is derived from the yeast organism." Yeah, okay, but the yeast are fed GMOs. So they're playing mind games with their explanations. There is a verified non-GMO erythritol available today, by the way, and it's made by Pyure Brands, based in Florida. Pyure Brands offers alternative sweeteners for the health-conscious marketplace, and their product is USDA Organic certified and Non-GMO Project Verified. Erythritol, the main component of the sweetener Truvia, has a new, unexpected application -- it may be used as an insecticide. ...Researchers found that fruit flies fed with food that included erythritol or the erythritol-containing sweetener Truvia died much sooner than flies fed with food containing other types of sweeteners. "The more you get [fruit flies] to consume erythritol, the faster they die," Sean O'Donnell, a professor of biology at Drexel University in Philadelphia, told CBS News. "We are hoping to develop it into a human-safe insecticide," O'Donnell later says in the story. The abstract of the published study concludes, "Here we show that Erythritol, a non-nutritive sugar alcohol, was toxic to the fruit fly Drosophila melanogaster." ...adult flies raised on food containing Truvia displayed aberrant motor control prior to death. We therefore assayed motor reflex behavior through climbing assays. Flies raised on food containing Truvia showed a significantly decreased ability to climb. Researchers were also able to determine that stevia was not the cause of the problem. They also tested Purevia and found it was safe for fruit flies. Only erythritol, the main component of Truvia, replicated the toxic effects on fruit flies. Erythritol also exhibited a dose-dependent death response, meaning the more that was consumed by the flies, the more quickly they died. What to make of Truvia's usefulness as a pesticide? The FDA has declared Truvia to be safe for human consumption. Then again, the FDA has also declared aspartame to be safe for human consumption, so that doesn't carry any real credibility. Sugar alcohols are widely consumed by millions of people, but that also isn't any guarantee of their safety because Vioxx was also widely consumed by millions of people (while killing tens of thousands of them via heart attacks). Most people believe sugar alcohols are safe to consume, and perhaps they're right. But maybe there's some yet-unknown contaminant in erythritol that's causing these toxic effects. Or perhaps it's the GMO connection, since most erythritol comes from genetically modified corn. A really interesting study on this would test GMO-derived erythritol vs. non-GMO erythritol to determine if there's any difference. Many scientists might also argue that perhaps erythritol is perfectly safe for humans and only selectively toxic to insects because of their different physiology. That would be the best-case scenario. If true, it opens up a positive conclusion to all this: What if erythritol could be used as a natural pesticide that replaces the toxic chemical pesticides sold by companies like Monsanto and DuPont? Imagine, if you will, a natural, plant-based pesticide that could be sprayed on crops to kill insects, yet still eaten by humans in trace amounts with no ill effects. That's the hope of this discovery: maybe sugar alcohols can be sprayed on crops or used in organic food production. By the way, the idea for this research came from a sixth-grader named Simon D. Kaschock-Marenda, once again proving that science is available to everyone, including children. This is why I have openly called for enhanced science education in America -- in the hope that more children can learn about scientific investigations and use their knowledge to help achieve a safer, less toxic world.